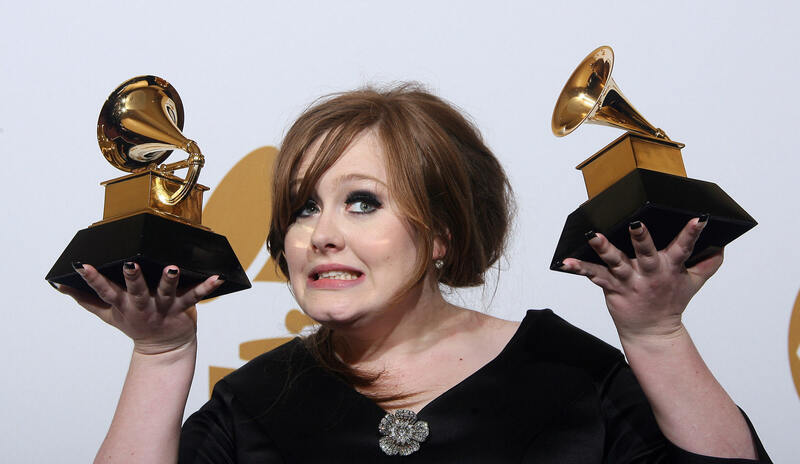 In 2009 at the 51st Grammy awards Adele won a Grammy for "Best New Artist" in an outfit that makes her barely recognizable to those of us who know her now. That sentence is almost laughable to me, because the English Queen (no, not that one) is a multi-platinum artist with sales estimated to be at more than 10 million for combined singles and albums. She essentially stole the phrase "Hello" from the general population. She also totally slayed at carpool karaoke with James Corden a few weeks ago. Adele is everywhere these days! Lately she's been known for mastering the perfect winged liner, her amazing new bob, and her masterful layering abilities. She is also the picture of sophistication in almost every dress she has ever worn to award shows. She tends to go with solid colors paired with a little bit of sparkle overlaying each outfit, but sometimes she is fully patterned like her 2013 Grammy's red and pink flowered carpet dress. It's safe to say that over the past seven years, Adele has become a cultural and musical icon. We can learn from her style transformation by looking back at the very first Grammy's outfit in which she won not one but two Grammy awards. Look at how different she is! The eye makeup and cheekbones are just as, if even more, dramatic. I would know that smile anywhere, however. The puffy updo and full satin belted dress paired with a bright chartreuse overcoat is an outfit I think she might say, "Oh, bullocks!" to nowadays. And that little sparkly rhinestone flower at the v-neckline is so cutesy. Her style really has evolved.